There are a number of sample datasets available in Machine Learning Studio that you can use for training data. For information on these, see Use the sample datasets in Azure Machine Learning Studio. Machine Learning Studio is designed to work with rectangular or tabular data, such as text data that's delimited or structured data from a database, though in some circumstances non-rectangular data may be used. It's best if your data is relatively clean before you import it into Studio. For example, you'll want to take care of issues such as unquoted strings. However, there are modules available in Studio that enable some manipulation of data within your experiment after you import your data. Depending on the machine learning algorithms you'll be using, you may need to decide how you'll handle data structural issues such as missing values and sparse data, and there are modules that can help with that. Look in the Data Transformation section of the module palette for modules that perform these functions. At any point in your experiment, you can view or download the data that's produced by a module by clicking the output port. Depending on the module, there may be different download options available, or you may be able to visualize the data within your web browser in Studio. If you import data in a format such as ARFF that includes metadata, Studio uses this metadata to define the heading and data type of each column. If you import data such as TSV or CSV format that doesn't include this metadata, Studio infers the data type for each column by sampling the data. If the data also doesn't have column headings, Studio provides default names. You can explicitly specify or change the headings and data types for columns using the Edit Metadata module. Studio uses an internal data type called data table to pass data between modules. You can explicitly convert your data into data table format using the Convert to Dataset module. Any module that accepts formats other than data table will convert the data to data table silently before passing it to the next module. If necessary, you can convert data table format back into CSV, TSV, ARFF, or SVMLight format using other conversion modules. Look in the Data Format Conversions section of the module palette for modules that perform these functions. Modules in Machine Learning Studio support datasets of up to 10 GB of dense numerical data for common use cases. If a module takes more than one input, the 10 GB value is the total of all input sizes. You can sample larger datasets by using queries from Hive or Azure SQL Database, or you can use Learning by Counts preprocessing before you import the data. 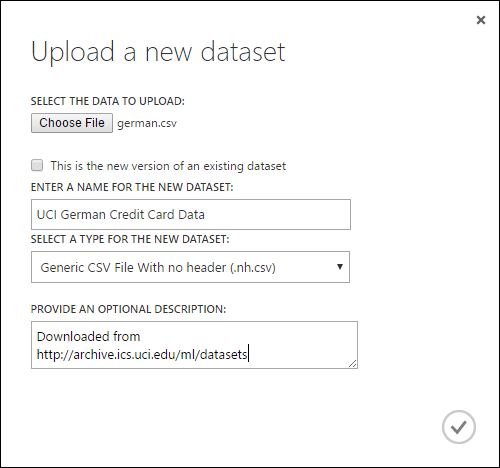 For datasets that are larger than a couple GBs, upload the data to Azure Storage or Azure SQL Database, or use Azure HDInsight, rather than uploading directly from a local file. You can find information about image data in the Import Images module reference. You can upload a data file from your hard drive to use as training data in Studio. When you import a data file, you create a dataset module ready for use in experiments in your workspace. Click +NEW at the bottom of the Studio window. Select DATASET and FROM LOCAL FILE. In the Upload a new dataset dialog, browse to the file you want to upload. Enter a name, identify the data type, and optionally enter a description. A description is recommended - it allows you to record any characteristics about the data that you want to remember when using the data in the future. The checkbox This is the new version of an existing dataset allows you to update an existing dataset with new data. To do so, click this checkbox and then enter the name of an existing dataset. Upload time depends on the size of your data and the speed of your connection to the service. If you know the file will take a long time, you can do other things inside Studio while you wait. However, closing the browser before the data upload is complete causes the upload to fail. Once your data is uploaded, it's stored in a dataset module and is available to any experiment in your workspace. When you're editing an experiment, you can find the datasets you've uploaded in the My Datasets list under the Saved Datasets list in the module palette. You can drag and drop the dataset onto the experiment canvas when you want to use the dataset for further analytics and machine learning. Using the Import Data module, your experiment can import data from various online data sources while the experiment running. This article provides general information about the Import Data module. For more detailed information about the types of data you can access, formats, parameters, and answers to common questions, see the module reference topic for the Import Data module. Because this training data is accessed while your experiment is running, it's only available in that experiment. By comparison, data that has been stored in a dataset module is available to any experiment in your workspace. To access online data sources in your Studio experiment, add the Import Data module to your experiment. Then select Launch Import Data Wizard under Properties for step-by-step guided instructions to select and configure the data source. Alternatively, you can manually select Data source under Properties and supply the parameters needed to access the data. The online data sources that are supported are itemized in the table below. This table also summarizes the file formats that are supported and parameters that are used to access the data. Currently, the Import Data and Export Data modules can read and write data only from Azure storage created using the Classic deployment model. In other words, the new Azure Blob Storage account type that offers a hot storage access tier or cool storage access tier is not yet supported. Generally, any Azure storage accounts that you might have created before this service option became available should not be affected. If you need to create a new account, select Classic for the Deployment model, or use Resource manager and select General purpose rather than Blob storage for Account kind. For more information, see Azure Blob Storage: Hot and Cool Storage Tiers. Web URL via HTTP Reads data in comma-separated values (CSV), tab-separated values (TSV), attribute-relation file format (ARFF), and Support Vector Machines (SVM-light) formats, from any web URL that uses HTTP URL: Specifies the full name of the file, including the site URL and the file name, with any extension. Data format: Specifies one of the supported data formats: CSV, TSV, ARFF, or SVM-light. If the data has a header row, it is used to assign column names. Hadoop/HDFS Reads data from distributed storage in Hadoop. You specify the data you want by using HiveQL, a SQL-like query language. HiveQL can also be used to aggregate data and perform data filtering before you add the data to Studio. Hive database query: Specifies the Hive query used to generate the data. HCatalog server URI : Specified the name of your cluster using the format <your cluster name>.azurehdinsight.net. Hadoop user account name: Specifies the Hadoop user account name used to provision the cluster. Hadoop user account password : Specifies the credentials used when provisioning the cluster. For more information, see Create Hadoop clusters in HDInsight. Location of output data: Specifies whether the data is stored in a Hadoop distributed file system (HDFS) or in Azure. If you store output data in HDFS, specify the HDFS server URI. (Be sure to use the HDInsight cluster name without the HTTPS:// prefix). If you store your output data in Azure, you must specify the Azure storage account name, Storage access key and Storage container name. SQL database Reads data that is stored in an Azure SQL database or in a SQL Server database running on an Azure virtual machine. Database server name: Specifies the name of the server on which the database is running. In case of Azure SQL Database enter the server name that is generated. Typically it has the form <generated_identifier>.database.windows.net. Database name : Specifies the name of the database on the server. Server user account name: Specifies a user name for an account that has access permissions for the database. Server user account password: Specifies the password for the user account. Database query:Enter a SQL statement that describes the data you want to read. On-premises SQL database Reads data that is stored in an on-premises SQL database. Data gateway: Specifies the name of the Data Management Gateway installed on a computer where it can access your SQL Server database. For information about setting up the gateway, see Perform advanced analytics with Azure Machine Learning Studio using data from an on-premises SQL server. Database server name: Specifies the name of the server on which the database is running. User name and password: Click Enter values to enter your database credentials. You can use Windows Integrated Authentication or SQL Server Authentication depending upon how your on-premises SQL Server is configured. Azure Table Reads data from the Table service in Azure Storage. If you read large amounts of data infrequently, use the Azure Table Service. It provides a flexible, non-relational (NoSQL), massively scalable, inexpensive, and highly available storage solution. The options in the Import Data change depending on whether you are accessing public information or a private storage account that requires login credentials. This is determined by the Authentication Type which can have value of "PublicOrSAS" or "Account", each of which has its own set of parameters. Table URI: Specifies the Public or SAS URL for the table. Specifies the rows to scan for property names: The values are TopN to scan the specified number of rows, or ScanAll to get all rows in the table. If the data is homogeneous and predictable, it is recommended that you select TopN and enter a number for N. For large tables, this can result in quicker reading times. If the data is structured with sets of properties that vary based on the depth and position of the table, choose the ScanAll option to scan all rows. This ensures the integrity of your resulting property and metadata conversion. Account name: Specifies the name of the account that contains the table to read. Account key: Specifies the storage key associated with the account. Table name : Specifies the name of the table that contains the data to read. Rows to scan for property names: The values are TopN to scan the specified number of rows, or ScanAll to get all rows in the table. If the data is homogeneous and predictable, we recommend that you select TopN and enter a number for N. For large tables, this can result in quicker reading times. Azure Blob Storage Reads data stored in the Blob service in Azure Storage, including images, unstructured text, or binary data. You can use the Blob service to publicly expose data, or to privately store application data. You can access your data from anywhere by using HTTP or HTTPS connections. The options in the Import Data module change depending on whether you are accessing public information or a private storage account that requires login credentials. This is determined by the Authentication Type which can have a value either of "PublicOrSAS" or of "Account". URI: Specifies the Public or SAS URL for the storage blob. File Format: Specifies the format of the data in the Blob service. The supported formats are CSV, TSV, and ARFF. Account name: Specifies the name of the account that contains the blob you want to read. Path to container, directory, or blob : Specifies the name of the blob that contains the data to read. Blob file format: Specifies the format of the data in the blob service. The supported data formats are CSV, TSV, ARFF, CSV with a specified encoding, and Excel. If the format is CSV or TSV, be sure to indicate whether the file contains a header row. You can use the Excel option to read data from Excel workbooks. In the Excel data format option, indicate whether the data is in an Excel worksheet range, or in an Excel table. In the Excel sheet or embedded table option, specify the name of the sheet or table that you want to read from. Data Feed Provider Reads data from a supported feed provider. Currently only the Open Data Protocol (OData) format is supported. Data content type: Specifies the OData format. Source URL: Specifies the full URL for the data feed. Click the output of the module that you want to save as a dataset. When prompted, enter a name and a description that would allow you to identify the dataset easily. When the save finishes, the dataset will be available for use within any experiment in your workspace. You can find it in the Saved Datasets list in the module palette.